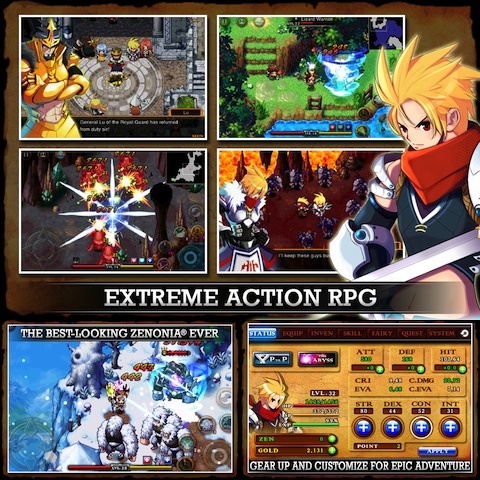 ZENONIA 4 is the latest installment of the Zenonia series, created by GAMEVIL Inc. 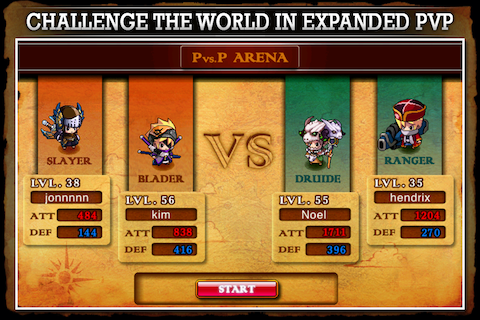 This iPod touch/iPhone app is an adventure RPG with an amazing sense of replay value. I, myself, am a huge fan of the Zenonia series, having come upon it while being asked to review the third installment. However, that being said, this is definitely, hands down, the best installment in the series. And I’ll even go a bit further and say that this is one of the best games to ever be released as an application on the iPhone. The story is just as interesting and in depth as any of the other Zenonia games. It takes time to flesh everything out and, at times, can be rather confusing. But in the end, it’s all worth it. I must say that I was a bit confused at first about being forced to start the journey as a Slayer, especially as you’re promised the choice of four distinct classes. However, no more than a minute into the adventure, thanks to some helpful story structure, you’re given the chance to change your class or keep it the same. The amount of customization in the game is almost unbelievable, and is probably the best part of the entire experience. On top of having four classes to choose from in the beginning, you are also given a large map of skills that you may choose to learn. Most games would go ahead and stop there, however Zenonia is not like most games. You can also equip your character with various suits of armor which not only affect your character’s strength, but also the way that they look on the field. The graphics are absolutely to die for. While they aren’t 3D or insanely realistic, they’re absolutely perfect for the type of feel that Zenonia has to it. The images are gorgeous in their own quirky way, which just makes the entire experience very enjoyable. The audio presents itself in a similar manner to the graphics, by being present in a way that enhances the game’s atmosphere in every way possible, without being overly prevalent and annoying. One thing that I did find to be a bit irksome was the loud vibration that would happen every time that you either took damage or hit something. However, that was an easy fix, as there’s a trigger in the “options” menu which allows you to control whether you want vibration or not. The controls work surprisingly well and don’t get in the way like they do with some similar iPhone games. Overall, including the fact that the game is absolutely free, I’d say that Zenonia 4 is a definite must-buy app. AppSafari review of ZENONIA 4 was written by Ryan C. Robert on December 21st, 2011 and categorized under Adventure, App Store, Featured, Free, Fun, Games, RPG. Page viewed 5725 times, 1 so far today. Need help on using these apps? Please read the Help Page.